Well, since Google is obviously your friend as mine – let’s not dwell too much with this topic. Digitalization is the fourth industrial revolution, meaning the fourth time technological advances of human kind result in an exponential leap of industrial productivity. Based on that statement, the logical definition of digitalization is the adoption of certain technological advances into the way we do business, so that the effect is not just improved, but revolutionized. Meaning that if you digitize the sound of an analog LP record, you can get digital MP3 audio. The video we previously stored on an analog VHS cassette can be digitally streamed through for instance Netflix, and so on and so forth. Digital means represented in a way that can be interpreted and processed by a computer, or IT system if you will. 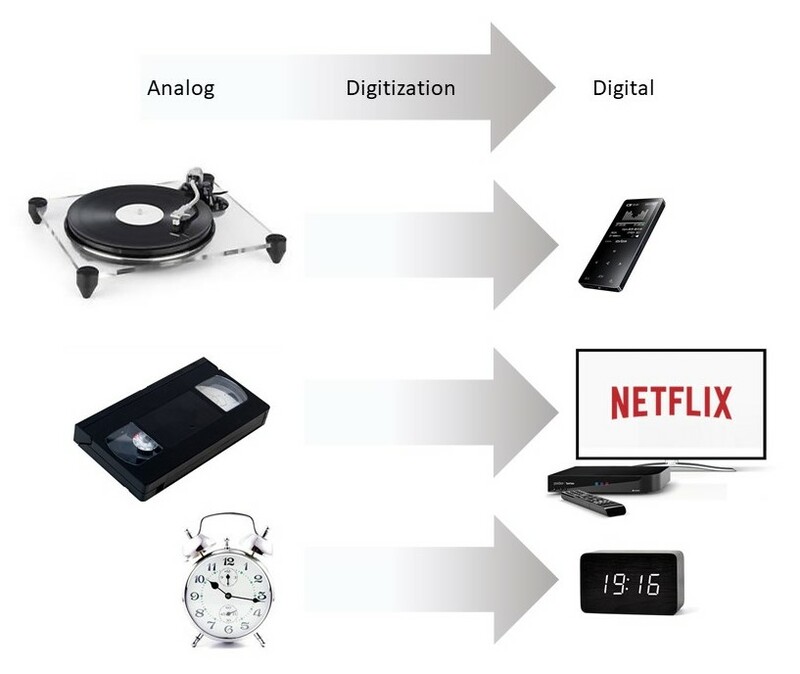 The process of converting from analog to digital, is called digitization – not digitalization, but the end result is digital in both cases. In both cases the purpose of making something digital is to make it more effective to handle. Anything that is represented digitally can be handled by computers, automated and integrated – such as all of the above into one device, your cellphone. That is probably the most well-known example, but the in reality the possibilities are endless once digital. Which brings us to digitalization, the process of making business digital – resulting in digital business. Business is a big term, which is probably why people start scratching their head thinking about making it digital. Most people are not too comfortable with big topics – and even if this is not about cosmos or existential questions (well for some it might actually be), it is still a potentially large topic. The limit for most of us is somewhere around three levels of complexity, beyond that it becomes an itch. So we need to simplify by conceptualizing and exemplifying. This way we can grasp the essence and deal with it without having to trouble ourselves with all the details – which then again can be separated, structured, and delegated. This part we can relate to – but what about making this business digital. First differ between digitalization, and just using computer technology, information technology or information systems to support your current business processes; which was the previous industrial revolution that came with computer technology in the 1970’s. Now we are talking about changing the business, and we change the business by changing the entities of business, the resources, the process and the products – making them digital, so that they can be integrated and automated. All of this is part of digitalization, as digitalization is the process of making business digital. Even though the goal is to make the business as a whole digital, whichever small part of the business you start with, it is still digitalization – it’s just not digital business, yet. Of course, not all entities of business can be digitalized in itself – audio and video can, but wood cannot. So it is a matter of digitalization of everything that can be digitalized – and for the rest, there is the possibility of digital metadata; such as information about the business entities, the resources, the wood or what have you. Such information is usually gathered using sensors, and the technology concept sorts under Internet of Things (IoT). Digital business entities data and metadata can then be integrated and automated end to end across the value chain, and the resulting information flows can be used to create new business models and products. With everything digital, changes can be made fast, whether it is scaling according to growth and demand, or rapid innovation. This is the target state of digital business, and digitalization in a nutshell. The devil is as always in the details, but now at least we have a common high level understanding.